Heavenly Most Gracious Father, you are omnipotent and you reign over all the earth. There is nothing in this world that could hinder or defeat your mighty power. Evil may try to test us in the most tempting of ways, but you Oh Father never leave our sides in times of desperation. We ask your protection over us daily, just as a mother guards and watches over her new-born baby. Wrap us in your tender loving arms, Oh Lord. 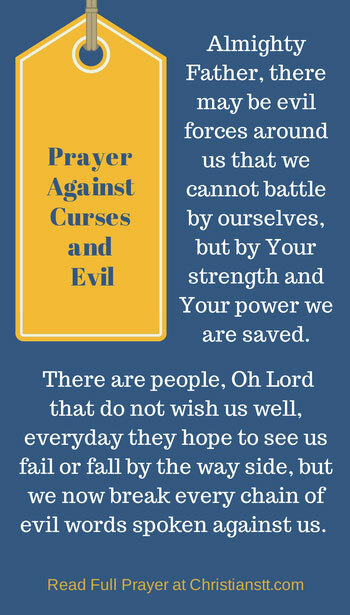 Almighty Father, there may be evil forces around us that we cannot battle by ourselves. But by Your strength and your power we are saved and we are overcomers. There are people, Oh Lord that do not wish us well. Everyday, they hope to see us fail or fall by the wayside. But I declare that every chain of evil words spoken against me is now broken. I am the head, never the tail, above never beneath. I have wisdom and divine strategies. Psalm 138:7 Though I walk in the midst of trouble, you preserve my life; you stretch out your hand against the wrath of my enemies, and your right hand delivers me. Proverbs 19:23 The fear of the Lord leads to life, and whoever has it rests satisfied; he will not be visited by harm. I break every curse that is set upon me and my family. The dark forces that attempt to lurk in every corner of this beautiful land, will disintegrate at the sound of your great name. I proclaim and declare that Jesus Christ has redeemed us from the curse of the law by becoming a curse for us, as it is written: “Cursed is everyone who is hung on a tree” (Galatians 3:13). I declare Satan has no hold over me now through curses or occult practices, through sacrifices or any ritual of any kind. Through the cleansing blood of Jesus Christ, I have been set free and I remain free. In the powerful name of Jesus, I break all generational curses placed upon my life and my family. I break all curses that are affecting my finances, my mind, my relationships, and emotions, in Jesus name. Give me strength, Oh Lord, to fight these battles, for with you all things are possible. In Jesus’ most precious name I pray, AMEN!! Isaiah 54:17 No weapon that is fashioned against you shall succeed, and you shall confute every tongue that rises against you in judgment. This is the heritage of the servants of the Lord and their vindication from me, declares the Lord.